Cinema is full of set designs so beautiful, you almost wish you they were real. Fritz Lang had vast chunks of city built forMetropolis. Joseph Mankiewicz nearly brought 20th Century Fox to its knees, so huge and sumptuous were his sets for 1963’sCleopatra. Thinking back over the course of movie history, how many films can you think of where the set itself is as big a star as the actors that emote within it? In Alien or Blade Runner, perhaps. The impossibly creepy motel and Victorian house of horrors in Psycho, maybe. The set in Stanley Kubrick’s The Shining, I’d argue, towers over all these. In no other film has an interior felt so mundane and yet so palpably evil – Jack Nicholson may rant and rave spectacularly as unhinged writer Jack Torrance, and Shelley Duval may act convincingly exhausted and terrified as his beleaguered wife, but it’s production designer Roy Walker’s set design that constantly dazzles. Credit must also go, of course, to John Alcott’s prowling cinematography, aided Garrett Brown and his wonder invention, the Steadicam, which allowed Stanley Kubrick, ever the technician, to pull off some of the most striking long takes in all cinema. Nevertheless, it’s the Overlook Hotel, at the time the biggest indoor set ever built, that bears so much of the film’s dramatic weight. This is partially because The Shining has such a simple story to tell. Pared back even by the standards of Stephen King’s source novel, the movie contains none of the rampaging elephant-shaped hedges or infernos of the original book. Instead, Kubrick’s film presents us with little more than embittered, failed writer, Jack, slowly growing crazy in a remote hotel. His wife Wendy (Duvall) and telepathic son Danny (Danny Lloyd) can do little more than look on in horror. At first glance, Kubrick and Walker appear to have created the perfect fusion between exterior and interior shots. At the start of the film, the outside of the Overlook we see is actually the Timberline Lodge, located in Oregon. The rest of the film’s exteriors and interiors, meanwhile, were immaculately constructed back at Elstree Studios in the UK. A world away from the dusty, peeling interiors usually seen in horror movies, the hotel interior envisioned by Kubrick is spacious and modern. The set generates tension not through claustrophobia and dark spaces, but with high ceilings and lonely expanses. Characters are frequently dwarfed by gigantic columns or huge windows. Even the carpets accentuate the how small and vulnerable Danny and his mother are; one shot shows the little boy playing on a carpet whose huge geometric patterns surround him like a cage. As he did in 2001: A Space Odyssey and A Clockwork Orange, Kubrick uses violent contrasts of colour to heighten the feeling of unease. There’s a key moment, where Grady (Philip Stone) ushers Jack into a bathroom and urges him, rather unsubtly, to “correct” his family. The acting in this scene is so intense that it’s easy to miss just how striking the actors’ surroundings are; unlike the warm, boozy golds of the ballroom Jack was drinking in seconds before, the bathroom is bathed in stark artificial light. The pure white ceiling and floor merely accentuate the startling crimson of the walls. The room is utterly unlike any other in the hotel – it’s as though it’s a direct projection of Jack’s violent mind, which it almost certainly is. 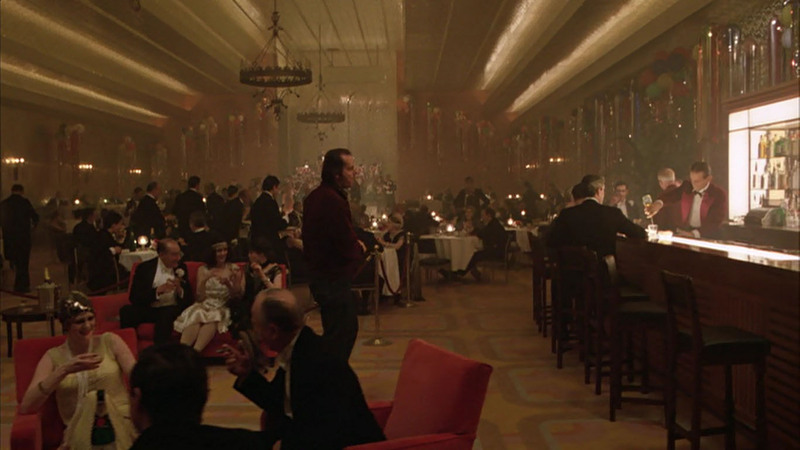 It’s but one example of how Kubrick uses colour and design to reflect the mood of his characters. As an example of how The Shining’s set takes us through those moods, take a look at the manager’s room, where Jack is interviewed at the beginning of the film – it’s a typical 70s office, its ugly salmon-coloured walls festooned with framed pictures. 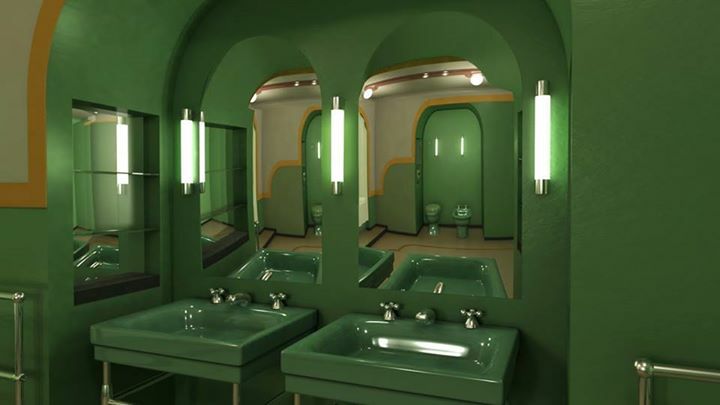 It’s vastly different from the supernatural ballroom or evil-looking bathroom seen in the film’s final act. 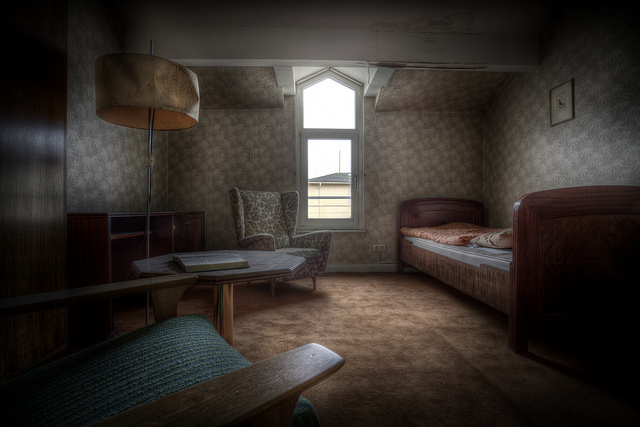 When Walker set about designing the film’s rooms, he took inspiration from real hotel rooms from around America, and went all over the country photographing different interiors. On his returm, Kubrick leafed through the pictures, chose the ones he liked, and had his production team construct rooms that looked exactly the same. The director described the process of designing the film’s sets in an interview with writer Michel Ciment. From a plan view, as one might see in an architect’s drawing, the Overlook’s layout doesn’t make any sense; hotel rooms open out straight onto balconies; what should be internal windows appear to have light coming from outside; corridors lead to abrupt dead ends. Not everyone agrees with Ager’s thesis, but I’d argue it’s too plausible to dismiss entirely. While it’s possible that Kubrick and his designers may have cut a few corners to cram their already enormous sets into the space available at Elstree, it’s unlikely that a director as meticulous and obsessed with minor detail as Kubrick would make so many glaring errors. Besides, Kubrick makes it obvious from the outset that the hotel’s architecture is vital to his story. His use of Steadicam isn’t merely a gimmicky use of new technology – it allows him to lead us around this weird interior landscape, across horrid carpets, polished floors and rugs, through its sprawling kitchen and storage rooms. He wants us to know how gigantic and dehumanising this place is – before the psychological wargames begin, he shows us the battleground on which they’ll take place. In the Overlook, Kubrick created a hotel that acts as a kind of psychological torture chamber, trapping its victims in a labyrinth of impossible corridors and rooms. Its design mirrors that of the hedge maze outside, cunningly built from a wood and wire mesh frame, with foliage threaded through it. This maze, with its eight-foot high walls, was complex enough for the crew to get lost in. Kubrick’s daughter Vivian shot a candid documentary of The Shining’s making, and the director and his crew are seen consulting maps of the maze’s layout. It’s been said that, at one point in The Shining’s year-long shoot, Kubrick had the maze walls rearranged, without telling certain members of the crew. When they became lost in its new layout, their cries for help were met with peals of laughter from Kubrick – laughter that, disconcertingly, seemed to becoming from all directions at once. 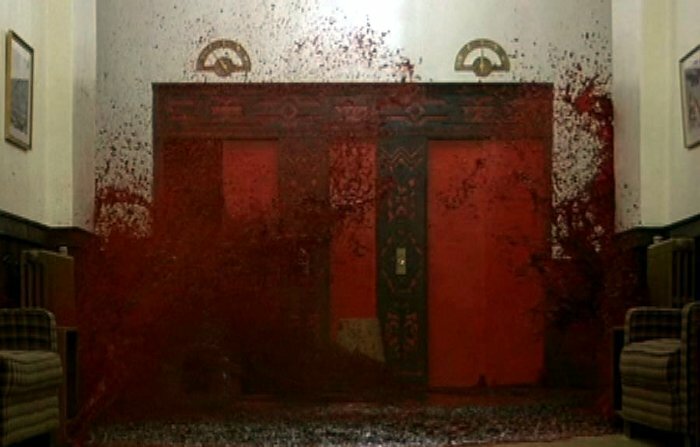 The Shining is the perfect example of the use of set design to enhance a narrative. 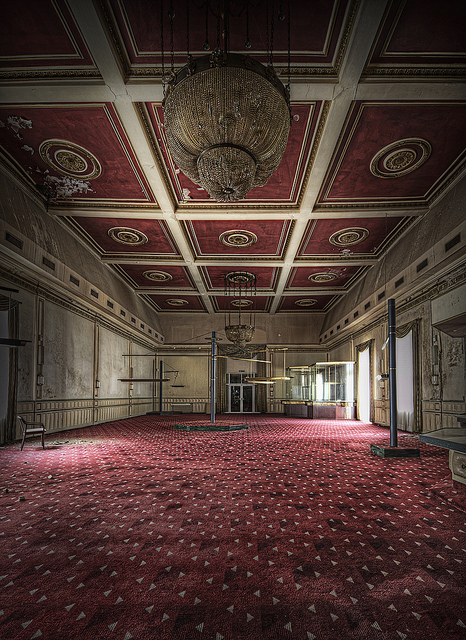 Combined with its cinematography, the viewer is left with the impression of a building that isn’t merely haunted, but alive, and actively observing its occupants’ every move. No other set in cinema is quite so oppressive, or so convincingly depicted – we barely notice the spatial anomalies that Ager points out, but it’s likely that on some subconscious level, our brain notices, and shudders. 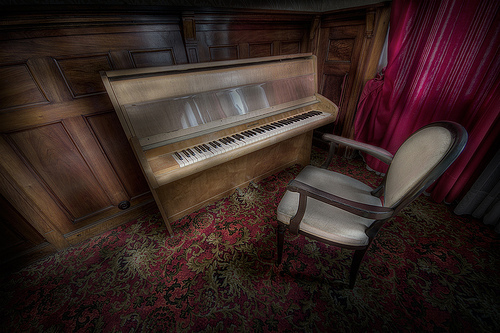 The Shining’s shoot was long and arduous. In his quest for perfection, Kubrick went through take after take. Scatman Crothers and Shelly Duvall clashed with the director. The latter even collapsed, exhausted, which was caught on camera by Vivian Kubrick. The film’s extraordinarily realistic lighting also took its toll: the pale sun shining through the vast windows in the main room was achieved with a bank of powerful studio lights – so powerful were these, the set eventually caught fire. Rather than work with the footage he’d already shot, Kubrick, perfectionist to the last, had the set rebuilt from scratch. Kubrick’s maniacal approach to filmmaking resulted in one of the most unusual entries in the horror canon. Its performances are desperate and sometimes bizarre, its images wavering violently between the starkly real and the surreal. And then there’s the Overlook itself, watching, waiting – it’s entirely unforgettable, and perhaps the most striking haunted house in all cinema. Now to end the first part of this post I would very strongly suggest that you check out this documentary. If you liked The Shining and do not know precisely why, this might bring you all the answers you need and more. Just do yourself a favor and watch it. Kubrick was rumoured to have an IQ of almost 200, so if you think it is impossible he thought of anything that is mentionned in this documentary, you might want to reconsider using that to rebuff ROOM 237. I’m not saying it’s all true, but there are for sure some things in there that were changed for a very definite reason. You judge for yourself. If you like Kubrik, you will love seing how much of a genius he was. So here it is for you, totally freeé Just click, lay back and watch with an open mind. Would love to her your impressions, good or bad. The original film is suppose to be around 102 minutes. This one is a bit shorter but if you have Netflix you can watch the original on there. I also found one that was more than 2 hours long on VEOH but this is the best link I could get. 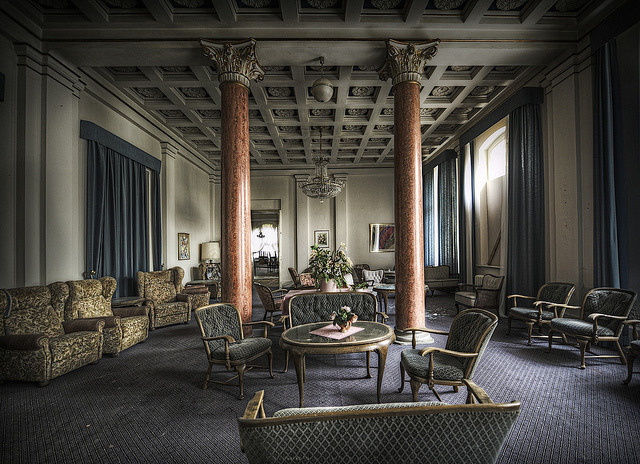 The Real Abandoned Overlook Hotel Unlike the fictional Overlook Hotel in Stanley Kubrick’s The Shining, this hotel is really named the Overlook. 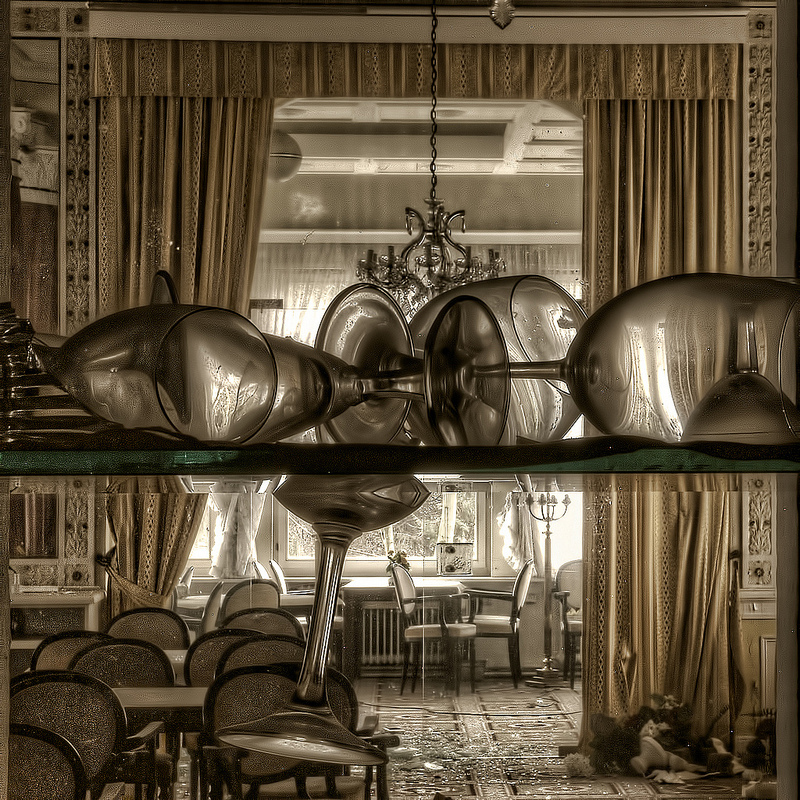 The abandoned hotel is located in the small, wine growing town of Bernkastel-Kues in Germany. Other than it has been unoccupied for about 13 years, there is no information as to why the hotel was closed. All of the furniture remains and it looks as if everyone there simply left. 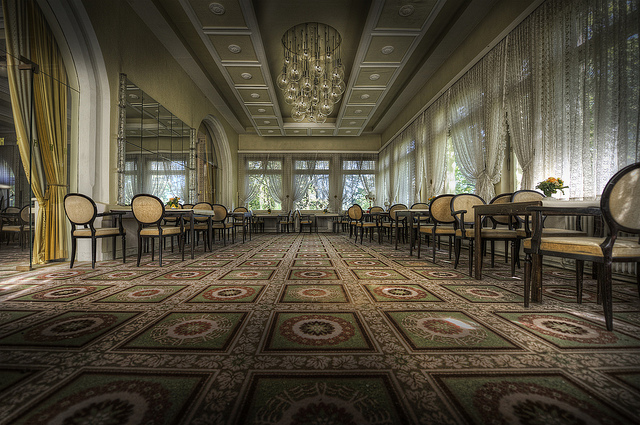 There are rumors that the hotel is haunted. 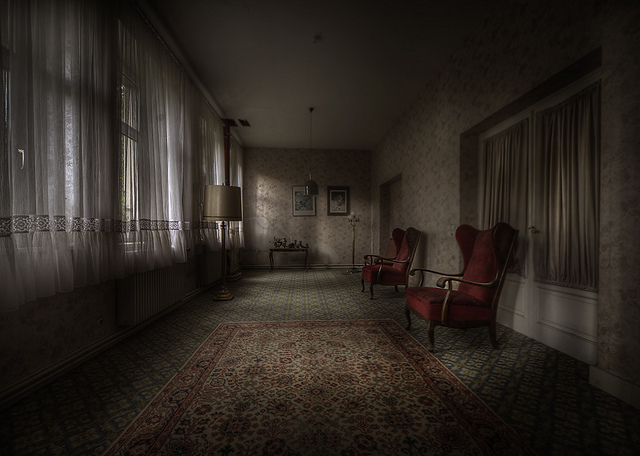 According to urban explorers who frequent the spooky site, cameras malfunction, sounds can be heard throughout the premises and items seem to move around the hotel by themselves. Your pics are truly amazing btw. I sincerely mean that mate!! Hey thank you very much Tobe. A little suprised you didn’t like my post about Keith Richards biography as much… But it’s true The Shining is and always be an outstanding movie full of yet undiscovered traps and doors !! Kubrik was litteraly a genius!